To understand dynamic filtering, let’s begin by re-stating something probably obvious about a normal equalizer: you always get what you set. In other words, when you specify a 6 dB boost at 100 Hz you get exactly 6 dB of boost at 100 Hz. But GlissEQ is different. When you specify a 6 dB boost at 100 Hz, you don't necessarily get a 6 dB increase in gain. Instead, the filter’s effective gain is adjusted dynamically according to the program material. That is what we mean by dynamic filtering and it is the key to GlissEQ. You should notice these immediate benefits: boosting highs with GlissEQ tends to avoid the fatiguing effect of overload. And boosting lows avoids making things sound mushy. Instead, you get a pleasant emphasis of transients, bringing life and dimension to your tracks. 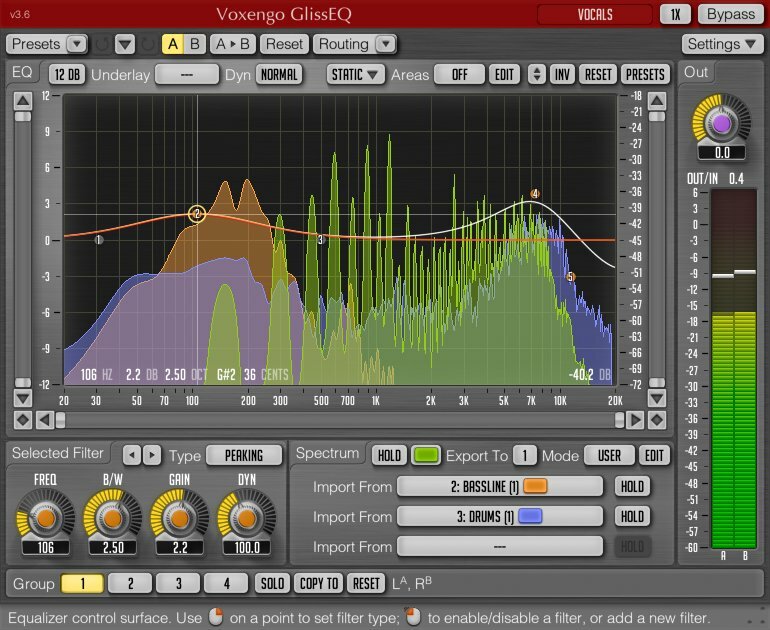 In short, the “dynamic behavior” of GlissEQ’s filters gives you a helping-hand during mixing and mastering. In addition to dynamic filtering, GlissEQ also features a real-time spectrum analyzer. The spectrum of a track can be exported to any other instance of GlissEQ thus making real-time inter-track spectrum comparisons possible. 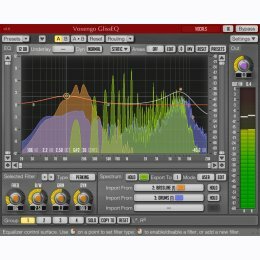 This helps you free frequency ranges on one track to allow an instrument on another track occupying same frequencies to breathe.